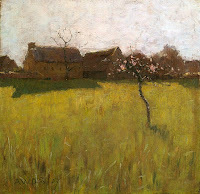 the more i read about arthur wesley dow, the more i find him reported to be as spiritual and ecumenical about everything, his art, his studies, as he is about his religion. a quiet man without whose presence, an art seminar was considered a failure. after studying in all of the most upstanding and academic parisian schools, and meeting and learning from the nabis, dow returned home to ipswitch, deflated. he hadn't found what he had sought. the academie dictated copying antiques, sketching models. "Truth in the form of representa- tional accuracy has no relevance in art, Dow came to feel. Only beauty matters, beauty realized through expression, not imitation. when i look at his photography, and then his prints, sometimes his paintings, the photos seem clearly to be 'sketches' for his prints, but his great-grand-daughter says that wasn't the case. at one point his photography became his primary focus -- "just a newer way of printmaking," he said. but since he wished neither to be known as a photographer rather than a painter, nor to compete with kasebier and stieglitz. sometimes he would go out to attempt to recreate some of his prints and painting with his new tool, the camera. i have to wonder though, still. really? An impas- sioned advo- cate of synthesizing lessons from East and West in the teaching and practice of art, Dow proved himself adept at doing just that. Less an originator of ideas than a consolidator and popularizer, he channeled diverse tributaries of influence into one concentrated, easily navigable river. 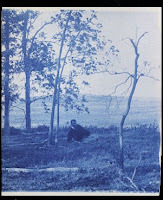 i promise we'll go into dow's book, composition, soon, but first, there he is sitting overlooking the marshes, in a photo taken by his brother dana, with such a sweet, young, flirtatious tree at the fore. is it the same as the young cherry in the painting, are they the same as the one in the print? i like to believe so, and to see dow as the first hippie, in the very best, most honorable sense of the word. "Only beauty matters, beauty realized through expression, not imitation." Wow....can't wait to learn more about this guy from you, lily! that's really interesting, evan. it reminds me of what roxy and i were talking about, how being out with one's camera can release you. interesting that we saw we "lose ourselves" when we're paying attention, looking looking, as you say. me too, lynn -- thanks! it's so interesting to have such a long 'love affair' become informed after all these decades. when i went to ipswitch (which was in 1991, not 1989 as i had thought), i went to the ipswitch historical society, which was mainly one old woman (by her own telling) alone in a big house with many relics of her father's having been in trade with china. and stacks of books about arthur wesley dow. it was a biography written and printed in 1934 -- 12 years after dow had died but at a time when many people were still alive who had known dow, and when thousands of his notes and his letters were still available to him. turns out this is *the* biography, the one every book, article, etc., refers to. the pages had never even all been fully cut, attached at top, bottom, or on the outside. I enjoy your presentations of gifted but "quiet" artists that have often been overlooked. Hope all is well with you these days Lotus/g. thank you dear princess. it's funny--dow has loomed so large for me for so long that i am surprised every time i run into someone who was not familiar with him, which is like EVERY DAY!